For Possible Lesson Plans Click Here! 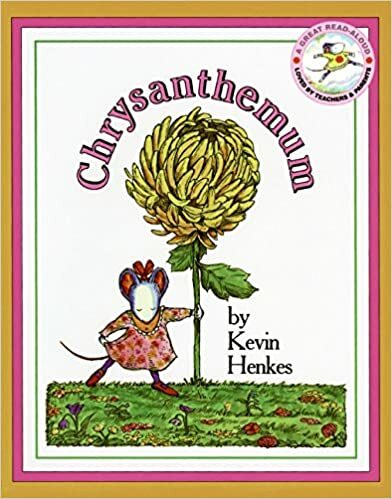 Summary: A bestseller written by Kevin Henkes, Chrysanthemum is a story about a precious little mouse named Chrysanthemum. When she was born, Chrysanthemum's parents decided that she needed a name as perfect as she was so they decided to name her Chrysanthemum. As she grew older, she grew more in love with her name, she believed it was absolutely perfect. When begins school, her classmates started to tease her and she began to think that her name was absolutely dreadful. In the end however, she realizes that her name is unique and absolutely perfect. Social Justice Element #1 - Self-Love & Knowledge: In this text, Chrysanthemum is a young mouse that absolutely loves everything about herself, especially her name because it is so unique. When she goes to school, her peers poke fun at her name because it is different, making her feel as though her name is not as great as she thought it was. This text shows the importance of feeling great about every aspect of oneself and not letting what others think have a negative toll on your self esteem. It is also a text that tells us that sometimes what others say may get us down but we just need to get right back up and this is shown when Chrysanthemum is reminded of how unique and beautiful her name is after her music teacher says she is considering the name Chrysanthemum for her unborn child, she realizes that nothing anyone else says matters, her name is the best name out there! How I would use this book: After reading this book, I feel as though it would be great to have a discussion with the class about the differences other people may have, whether it is their name, where they come from or anything else that may set them apart from their peers. This is a great thing to do with younger children especially because it is essential for them to grow up with the knowledge and idea that they may have peers that are different from them and that is perfectly fine. During this discussion, I feel as though it would be a good idea to have the class choose a name of one of their classmates out of a hat and allow them to share something they like about the classmate that they have picked.